Heat oil in a deep cast iron skillet to about 350 degrees. While the oil heats, in a medium sized bowl, add milk and egg and beat until well combined. In a pie plate or other shallow dish, combine flour, season salt and pepper until well mixed. Dredge each piece of cube steak into flour, dip in egg and milk mixture and then back into flour, coating all sides. Give each piece a little shake to remove extra flour and carefully place into hot oil. Repeat with remaining cube steak, cooking in batches. Cook each piece about 3 to 4 minutes on each side until lightly browned. They will cook quickly. Remove to a paper towel lined plate to drain. You may want to lower your heat slightly after the first batch, especially when using cast iron. In an 8-inch cast iron skillet, over medium-high heat, add bacon grease. When grease is melted, add flour, salt and pepper, whisking until all combined. Whisk occasionally as flour mixture starts to brown. You want it to get golden brown, but be careful to not let it burn. Gradually whisk in 3 cups of milk, and continue to whisk until it is thick and starts to bubble, adding more milk if it gets too thick. Lower heat and keep warm until serving. 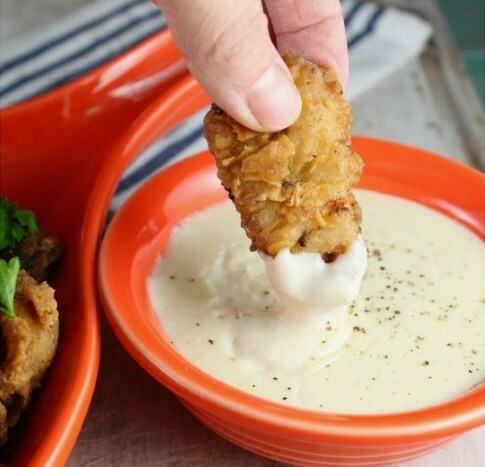 Serve with mashed potatoes and some buttered Texas Toast.